According to the Iceland Monitor, what will be the largest concert ever held in the country has been put together by organizers behind the annual Secret Solstice Festival. The group will ship 35 containers of gear for the week-long preparations for the remote location event, which will see a number of renovations to the stadium – including the building of a special floor to protect the field from concertgoers. 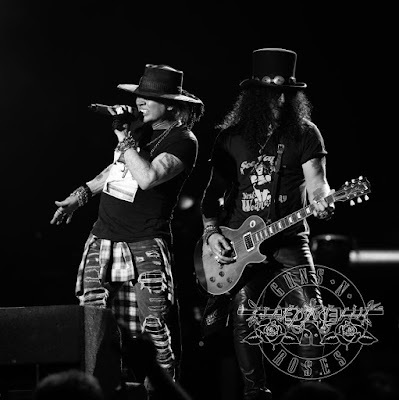 Currently the final date scheduled on Guns N’ Roses 2018 live schedule, the Iceland gig could mark the finale of the band’s three-year reunion run, which launched in Los Angeles on April 1, 2016 and is now among the top five biggest-selling concert tours in music history with gross sales of more than $475 million. The success of the trek is being recognized with a pair of nominations for the 2018 Billboard Music Awards. The trio of Axl Rose, Slash and Duff McKagan are finalists in the “Top Rock Tour” category alongside Coldplay and U2, while they’ll also compete for “Top Touring Artist” against Coldplay, Bruno Mars, Ed Sheeran and U2. Currently on a break, Guns N’ Roses will return to the stage for a series of summer 2018 concert dates across Europe that will begin in Berlin, Germany on June 3.